The North German actor will start at Pullman City with helmet and protectors in the 8 - dogs - class (Huskys) for the very first time. We are sure this guy will end up with 16 Alaskan Huskys at the Yukon Quest (without protectors) ...! The North German actor is also active as organiser of a special Husky promotion in Austria/Tyrol with a huge number of high grade prominent stars and starlets and - of course - high grade sponsors. He is also organising Golf and Horse events. A real professional! Before our SCANDINAVIA-MANIA, we also visited twice the Pyrenees (Pirena 2006 & 2008). After five winters together with mushers and sled dogs etc. we really saw the extreme wide range of charaters of mushers & dogs & trails & organisers & vets & dog handlers & officials & photographers & landscapes ... and SNOW! The Alpen-Trail Champion 2011 will be ...?! 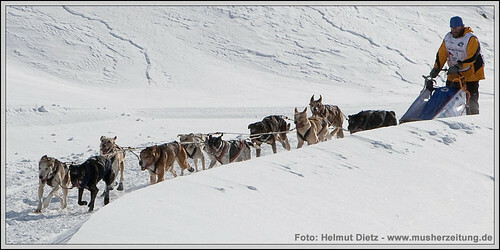 Some call it the most beautiful sled dog race in the Alpes, if not more: the Alpen-Trail. It's a little more than a sprint sled dog race and a little more than an ordinary mid distance sled dog race - not by distance but in difference in altitude. It's just the ALPEN-TRAIL. Special in any kind! This year it seems to be again a duel. Or more ...? What do you think? 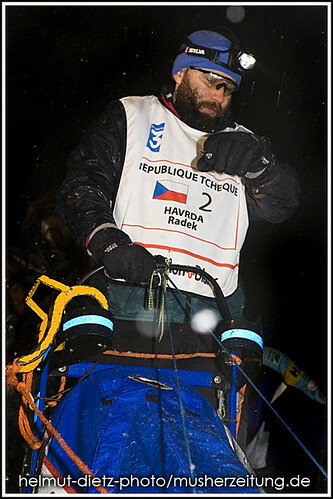 Which musher will be the Alpen-Trail Champion 2011? helmut-dietz-photos: the Alpen-Trail 2011 favourites?! PS: If you want to bet another trio, no problem, we are prepared to do so, just tell us your favourites and your price ... to musherzeitung@yahoo.de! 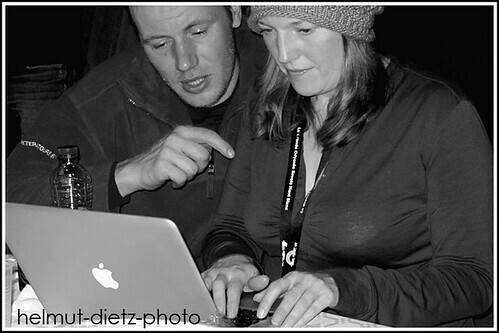 Unfortunately we'll not be able to see the Alpen-Trail Champions 2011 live. We'll be at La Grande Odyssee in France to see, if the Swiss will do it again - or if the Czechs will. And the trip to the last Alpen-Trail stage (which we did last year) is almost a world tour. 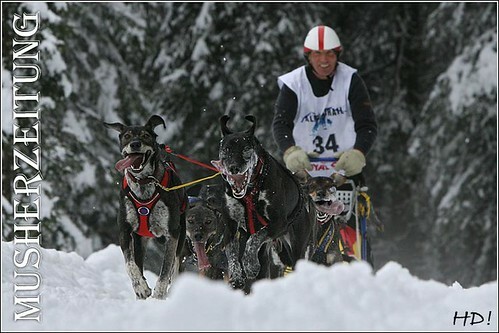 And what should you do, if you have seen the most beautiful sled dog race (at least in the Alpes) twice ...?! But you never know. 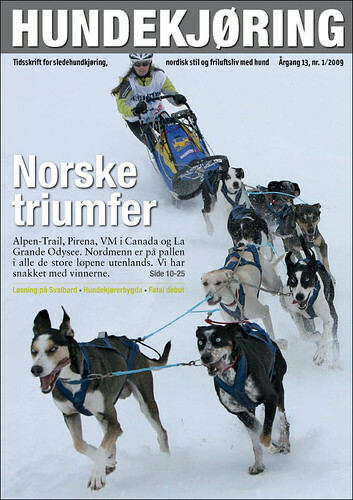 To see Norwegian sled dog teams is always a sled dog delicacy ... at least for us! 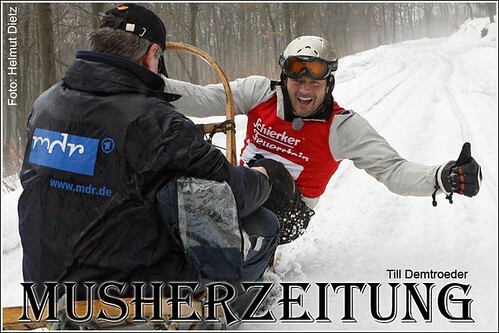 Good luck to all Alpen-Trail mushers, especially Marte, Roy, Bjørn Lyng, Heini, Helmut, Florian, Thorsten, Martin, Christoph, Kilian, Alfred, Sylvia, Claudia, Andreas, Vanessa, Matteo, Alain, Luzi, Lutz, Erwin, Dominik, Baltsar, Winfried, Stefan, Gerhard, Mario, Volkmar, Manuela and the Skijoring mushers ...! 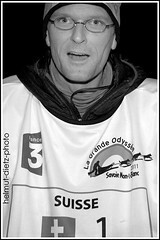 Which musher will be the Champion 2011 at "La Grande Odyssee" - the Alpine Sled Dog Marathon Stage Race? 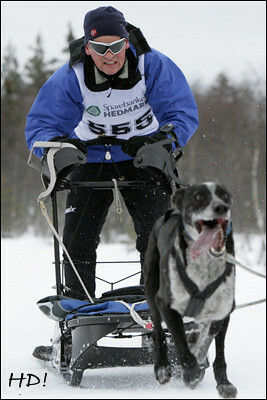 helmut-dietz-photo: Ketil Reitan and his dog team close to Kirkenes (Finnmarkslopet 2010). 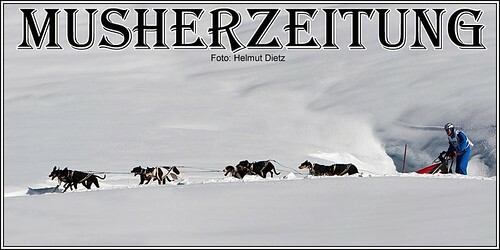 Which musher will be the LGO Champion 2011? helmut-dietz-photo: Alaska proven Michael Tetzner (left) is training in Hamar, Bavarian Musher (right) trained in the very north of Sweden, in Kiruna. ... hope both Germans will cross the finish line - twice! Cover girl Hege Ingebrigtsen (Narvik, Norway) will compete next weekend in Hamar too - of course! helmut-dietz-photo: Ketil & Evelyn Reitan in Avoriaz. Evelyn Reitan said: "I'll be very bussy this season. We'll participate at La Grande Odyssee, Femundlopet, Finnmarkslopet and Amundsen Race this year. Dogsa are fit, but Ketil as some problems in his back. 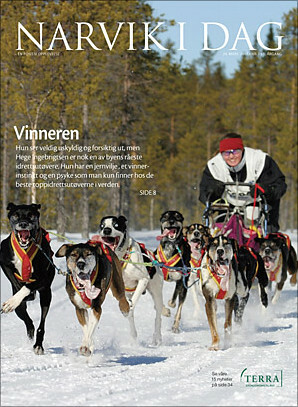 He's older now ..."
Ketil Reitan streched after crossing the finish line of stage 1 (60 km) the front legs of all his dogs and said: "For the dogs it was too short, the could do it again immediately." See here the LGO 2011 - Ranking. Emil Inauen im Ziel in Avoriaz: "Klar, hat das Wetter Auswirkungen auf den Trail, dort gibt es tiefe Löcher wo zwei Hunde verschwinden können und bockelhart gefrorenen Trail, wo es eisglatt ist. Man muss eben immer einen Kompromiss zwischen Racing und Rücksicht auf die Hunde eingehen." helmut-dietz-photo: Radek Havrda knows, that 2:08 minutes is not too much advantage for Emil Inauen after 3 stages. Will it be the exspected duel? It looks like this. But the Czech and Slovak sled dog power is impressive. Michael Tetzner 7 Sekunden vor Kjetil Hillestad! Kjetil Hillestad aus Norwegen (siehe Photo) war der einzige ernst zu nehmende Gegner in der OPEN CLASS SPRINT für Michael Tetzner aus Schleswig - Holstein beim Hamar Sled Dog Race in Norwegen am letzten Wochenende. Michael Tetzner hat das Duell mit 7 Sekunden für sich entschieden. Ergebnisse gibt es HIER! 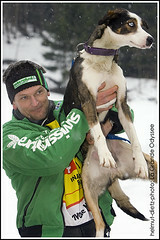 The stars of La Grande Odyssee 2011: Emil Inauen and his dogs (here his main leaddog - "Lady" is injured). After the stage of today from Morzine to Champery (CH) Emil Inauen increased his advantage, but Radek Havrda is not far behind. It's still a close game! Milos Gonda, secured place three now with a bigger gap between the next ones: Pontier (F) and Bily (CZ). Marte Heilemann und die beiden norwegischen Alpen-Trail - Rookies sind inzwischen in Langtaufers und gewöhnen sich an die neue Umgebung mit dem letzten Training vor ihrem großen Auftritt. Wir sind gespannt. 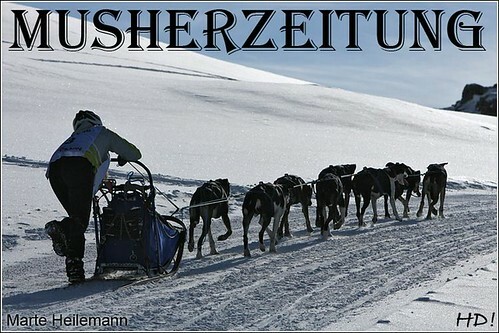 Die Meldungen auf www.alpentrail.de sagen momentan, dass das "schönste" Schlittenhunde - Rennen wohl stattfinden wird. Wir drücken die Daumen! Dem Rennen und den Norweger ... und natürlich allen Teilnhmern ...! 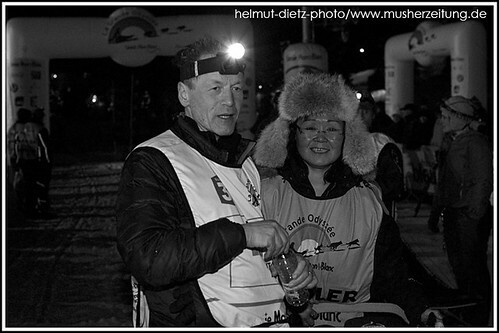 Helmut-dietz-photo: Marte Heilemann im Winter 2009 - als sie das Alpen-Trail gewonnen hat. Milos' goal for La Grande Odyssee: To survive! At La Grande Odyssee 100.000 $ is the total pricemoney. 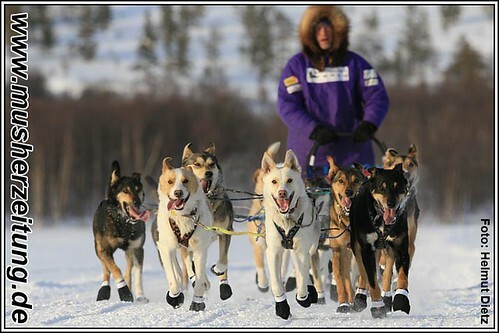 The first three mushers will gain 60.000 $ (1. 30.000 $ - 2. 20.000 $ - 3. 10.000 $). When we asked Milos Gonda about his ambition, he said "I'll be happy to survive here ..."